Maintaining HVAC equipment is a challenge all year round. As the seasons change, so do the obstacles for building managers. Richard Betts, Founder of RABScreen, discusses the importance of protecting HVAC equipment and how a simple product could save time, energy and money. As the summer days shorten and the pollen count falls, building managers everywhere breathe a sigh of relief, just like their HVAC equipment. Few people outside of the facilities management industry realise the impact airborne pollen grains can have. It blankets cooling coils and external air intake louvres, restricting airflow and forcing chillers, dry air coolers and AHUs to work harder. This means it consumes more energy, costs more to run and increases the risk of break down. With autumn in full swing, leaves tumble from trees – A facilities manager’s nightmare. As they’re taken by the wind, they get pulled into air inlets on HVAC equipment. This causes a particular problem for cooling towers because leaves are pulled through the channel into the fill where they remain while they decompose. This allows the formation of bacteria, which has water treatment implications if managed incorrectly. For the Game of Thrones aficionados among you, don’t panic. Though ‘Winter is coming’, it isn’t a precursor to white walkers, dragons and a significant battle for the Seven Kingdoms of Westeros. That said, winter in the UK is still a major challenge for building managers. High winds and poor weather conditions take their toll on heating and ventilation equipment. Hail can easily damage cooling fins on condenser units, reducing airflow and in severe cases, causing damage to fan motors and blades, resulting in catastrophic failure if left. Almost all HVAC equipment has an external inlet that is exposed to the seasons. Whether heating or cooling coils, air intake louvres, dry coolers, chillers or cooling towers, there often isn’t protection from the elements. There’s a simple solution. 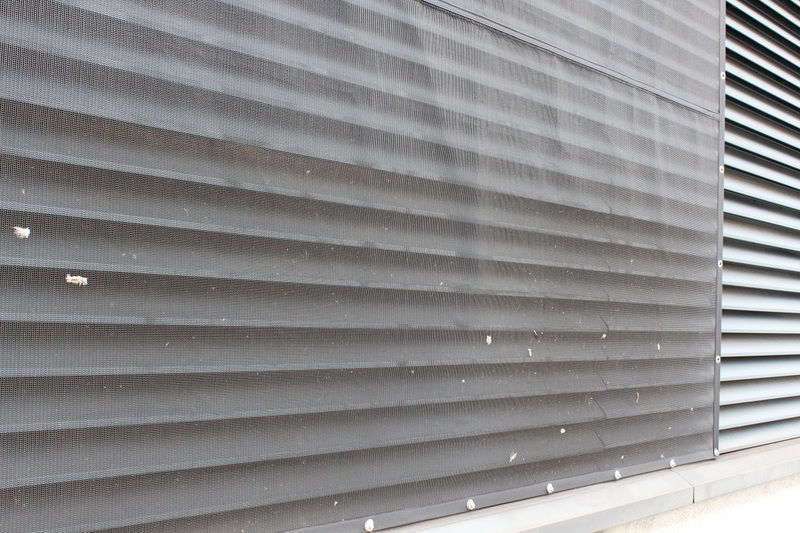 Heavy-duty air intake screens from RABScreen was created to serve one purpose: To provide a washable, long-life filter to protect air inlets without impacting airflow. Manufactured using a high-grade polyester and polypropylene composite, the negatively charged polyester and positively charged polypropylene work together, creating an electrostatic charge. Airborne particulates are drawn to the mesh and prevented from passing into HVAC equipment. Better still, it does so with no significant impact upon airflow. Unlike traditional filter media, heavy-duty air intake screens can be washed, wiped or vacuum cleaned – maintenance takes no time at all. And, because the material is so robust, air intake screens have a serviceable life of between five and ten years, provide a high degree of protection from inclement weather throughout. Air intake filters are a simple solution to a common problem. Preventing damage and clogging from airborne debris and poor weather conditions mean that the HVAC equipment doesn’t need to work so hard, increasing serviceable life, decreasing the risk of breakdown and reducing operational costs. What’s more, every heavy-duty air intake screen is made-to-measure specifically for its application, so you’re guaranteed a perfect fit every time. Easy to install. Easy to clean. Easy to see the benefits.